Khenpo Gangshar Wangpo (Tib. མཁན་པོ་གང་ཤར་དབང་པོ་, Wyl. mkhan po gang shar dbang po) (b. 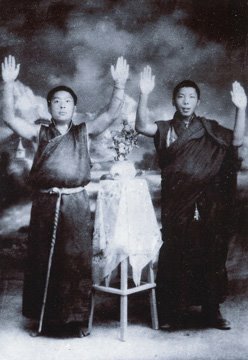 1925) - a renowned master of the 'crazy wisdom' approach, who was connected with Shechen Monastery. He was the root teacher of both Chögyam Trungpa and Thrangu Rinpoche, and also one of Dezhung Rinpoche's teachers. For a while it was thought that he died in prison between 1958 and 1961, but it has also been reported that he in fact survived 22 years of imprisonment, and passed away in 1980/1, before any of his former students could contact him. ↑ You can watch Chökyi Nyima Rinpoche teaching on Vomiting Gold on Dharma Sun. Look in the Buddhist Advice section (login required). Khenchen Thrangu, Vivid Awareness: The Mind Instructions of Khenpo Gangshar, with commentary by Khenchen Thrangu Rinpoche. Boston: Shambhala Publications, 2011. This page was last edited on 8 July 2018, at 00:04.